I’ve talked about quinoa numerous times, and always recommend it to clients who are looking for tasty ways to incorporate whole grains into their diet. 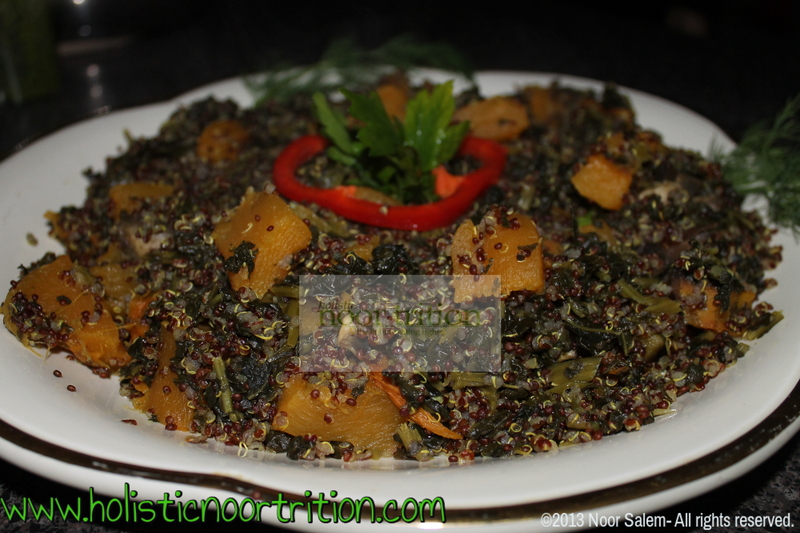 Quinoa is a wonderful high protein grain and it tastes great with almost anything. This recipe is so easy to put together once the initial step of baking the pumpkin and cubing it is over. I made this after my little sister came home from a field trip at the apple orchid. Pumpkin is very high in Vitamin A, and is a nutrient dense food. It carries anti-cancerous properties, potassium, and yes, Vitamin C too. Don’t hesitate; get pumpkin on your plate. I usually like this dish with parsley, but I was making the pesto full zucchini noodles that day and had a bunch of fresh dill on hand. It gave it an interesting flavorful kick. Sautee the coconut oil, mushrooms, and kale in a deep pot for about 5 minutes. Add about 5 cups water and the quinoa. Add all the spices and stir with a spoon to mix everything in evenly. Cover and allow it to cook for about 18 minutes; until the quinoa is tender. Fold in the fresh dill and mix slightly. Pour into a serving platter. Garnish with lemon slices, extra virgin olive oil, and red peppers. Make sure to cut the pumpkin in big cubes so they don’t become mush. Say that again? That’s right, spinach hummus. 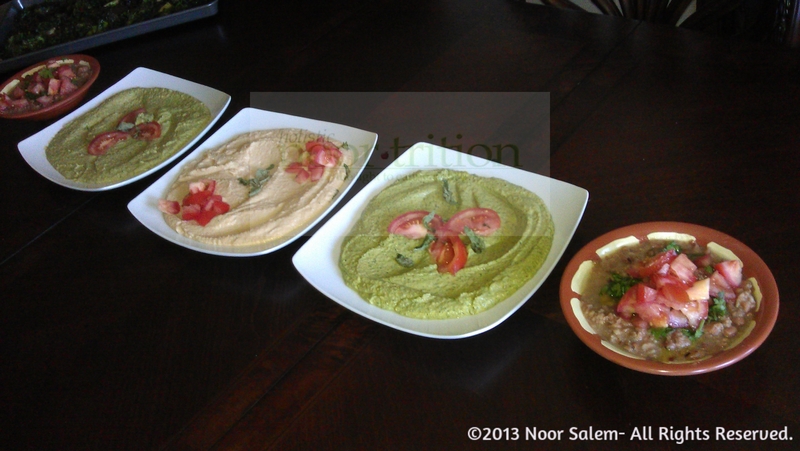 For those who already tried my kale hummus recipe, this is just slightly different in taste. In my group coaching class a few weeks ago, I made this as the food demo. Usually “green” looking food isn’t everyone-friendly, but every single client gave this recipe a thumbs up. Since one person could not have garlic, I replaced that with raw white onions from my original recipe. The onion gives a boost of health benefits, and natural antibiotic properties. 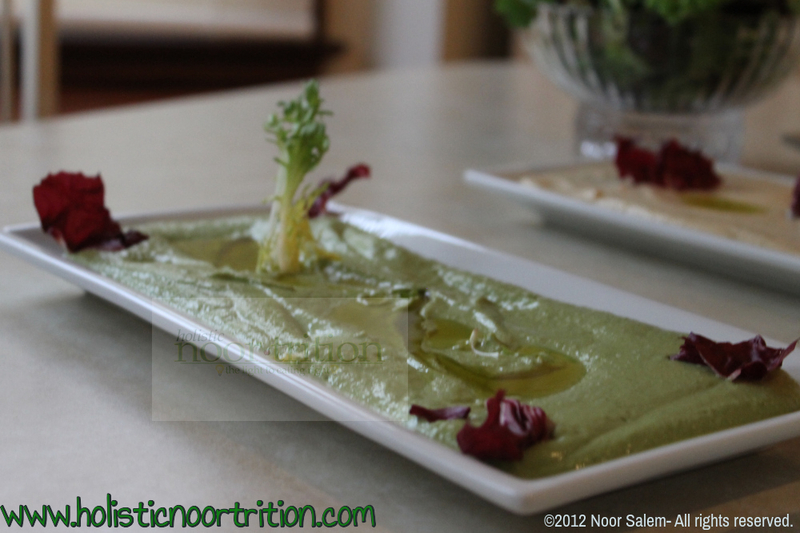 The chickpeas, extra virgin olive oil, Himalayan Pink Salt, and spinach put together make a health boosting dip! Wash and soak the chickpeas over night. Rinse again. Place onion, oil, lemon, spices, spinach, and water in the food processor. Pulse until liquefied. Add chickpeas and tahini sauce. Blend until very smooth. Place in a serving dish. 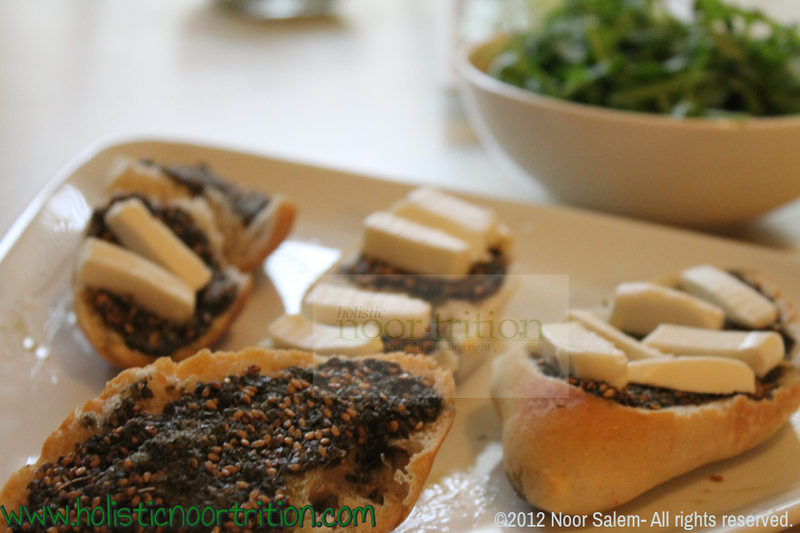 Drizzle with Extra Virgin Olive Oil and freshly chopped cilantro. My version with spinach, mint leaves, and kale mixed. Did Someone Say Kale Chips? This country lives on potato chips. Not only are they deep fried in hydrogenated oils, they are coated in sodium, unfriendly chemicals, and tons of preservatives. Basically we begin with a potato, and end with a potato stripped of its nutrients. Now potatoes are not bad for you at all, but it’s the way it’s cooked and prepared nowadays that makes it bad for you. Potatoes are high in potassium, Vitamin C, Vitamin B6, and plays role in cell building. Either way, why not boost the typical crunchy salty snack and create an astonishing scrumptious chip? Yes, I mean it, kale chips. Kale is a super green. It’s full of Vitamin K, Vitamin A, manganese, fiber, yes Vitamin C, and over a dozen other nutrients. What’s not to like about this chip? 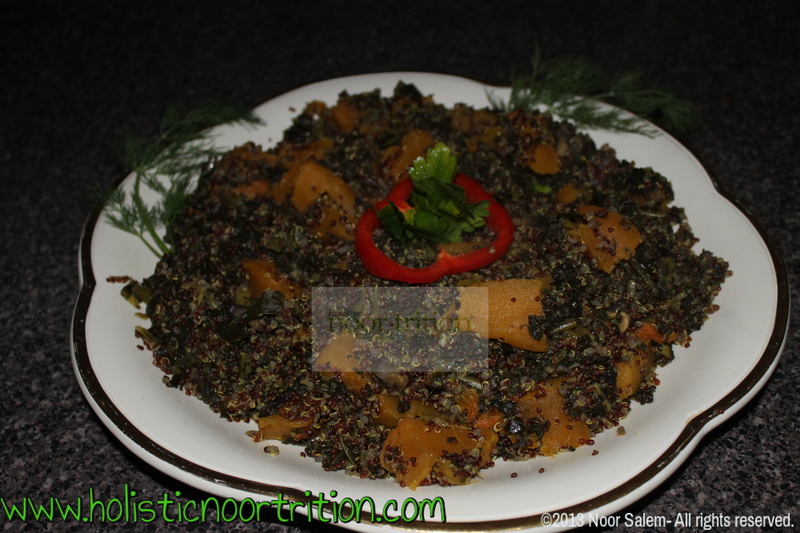 I top it with nutritious spices and organic coconut oil, one of the best oils to cook with. This recipe is gluten, dairy, soy, wheat, egg,, and chemical free. What’s not to like about this chip? Wash the Kale well after removing the stems. Allow them to dry. Washed and dried fresh kale. In a separate bowl melt the Organic Coconut Oil. If you’re using different oil that’s liquid at room temperature, simply measure the required amount and place it in a bowl. Bowl of oil and spices. Add the salt and spices to the bowl and mix well. 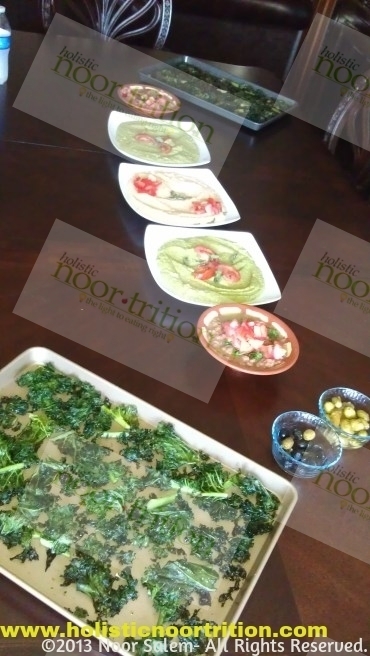 Toss the kale with the oil mixture well and place on a flat baking sheet. Kale tossed in oil and ready to bake. Bake in the oven for 8-9 minutes until toasted from the edges and darker in color. I woke up yesterday intending to make chick pea vegetable patties and grill them up in coconut oil with a side of hummus (chick pea, tahini and lemon juice dip). Things didn’t go as planned. I took out the blender. I made the hummus dip as usual and scooped it into the serving platter. I started at an extra cup and a half of chick peas and green vegetables and then, a light bulb lit. I tossed in the chick peas, greens, some spices, a drop of tahini to thicken it, and pulsed away! The results: amazing! So I present what I’d like to call “Green Hummus to the Max” since the maximum amount of Vitamin K, Vitamin A, and a bunch of other nutrients are sky rocketing high (thanks to the kale and mustard greens) and no one can tell. Toss all ingredients in the blender (use a food processor if you have one!) and pulse until smooth to the desired thickness you prefer. 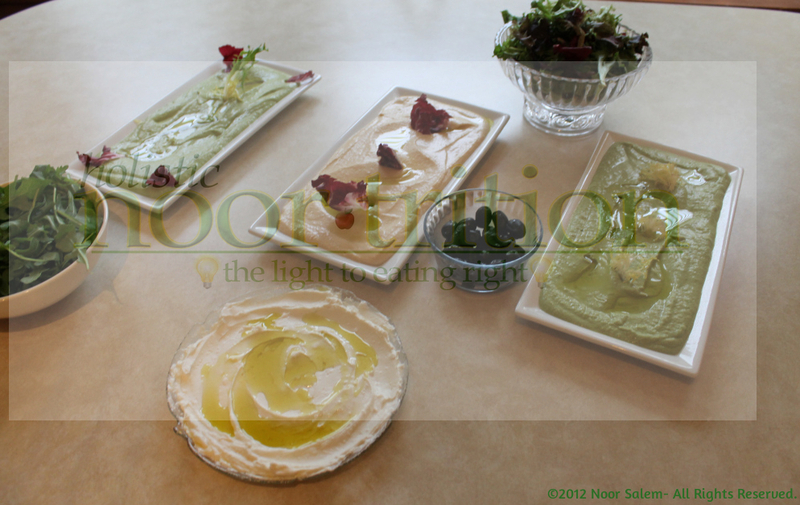 Place on serving platter and drizzle with extra virgin olive oil and garnish with fresh mint or spring mix leaves. 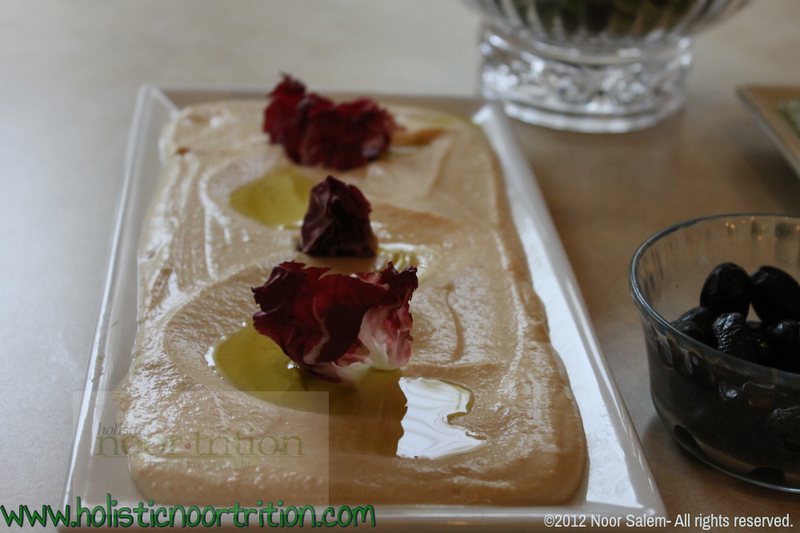 Serve with pita bread or vegetables as a dip. 2 cups organic kale, mustard greens, or even spinach! 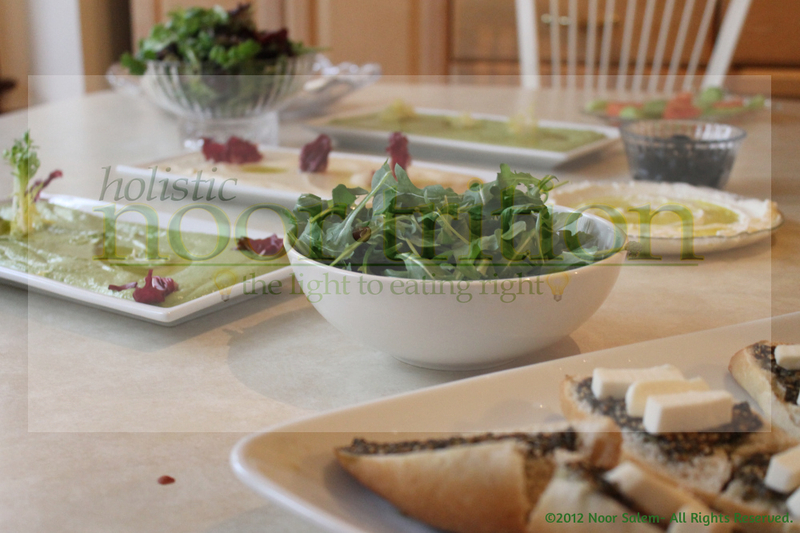 The Green stuff…the taste was family approved! Round whole wheat buns, oregano and extra virgin olive oil as well.